Visegr�d is rich with natural and historic attractions. 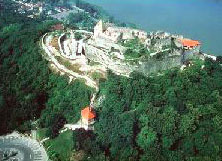 There are sites at three heights: the Main Street, the Solomon Tower and the Castle on the top of the hill. The latter offers a wonderful view of the Danube Bend. The Palace of the great Renaissance ruler, King Mathias (1458-1490), Solomon Towerwas ornamented with red marble fountains. In this marvellous environment this huge two-story building was one of the most luxurious royal residences of its time. The Renaissance court of the palace, and the Hercules Fountain which streams wine on holidays were authentically reconstructed by archaeologists. Nearby the five-story Solomon Tower is among the oldest and most intact Romanesque dwelling towers of Central Europe. Battle scenes are re-enacted in its yard during summer.